If you have a local business, particularly one which is prone to ratings and reviews, chances are you’re aware of Yelp. What you may not know is that Yelp is filtering your reviews. What is the Yelp Review Filter and why should you care? First, quickly, what is Yelp? Right, of course, you all know what Yelp is. You know about the Yelp review filter which catches the bad guys. You check in, you write and read reviews, and you live with your Yelp app open all the time on your smart phone. You, are a hipster. For the rest of us, I’ll explain. Yelp is a ratings and reviews site. 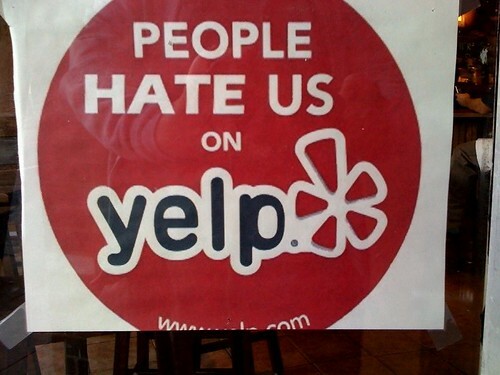 Businesses have listings on Yelp and patrons of that business may leave reviews. Yelp is notorious for long-form reviews, snarky reviewers and the Yelp Review Filter. What this means to you, is that as a business it may sting a little to be “Yelped” about. Aren’t there tons of Rating and Review Sites? Yes, there sure are, but Yelp would like to think they’re better than you them (sorry, Freudian slip). Yelp’s position is that review sites are too cluttered with spam to be truly useful. They also seem to think that a focus on long-form reviews and user interaction will help create the kind of rich review content users are looking for. In truth, the Yelp Review is often more helpful than the typical review site’s “Love the fish!”. For some reason in their press and rhetoric Yelp is especially dismissive of Citysearch as are their users. So what is this “Yelp Review Filter”? Yelp wants to assure the reviews in their engine are as clean and untainted by the business being reviewed as possible. Is the Yelp Review Filter Evil? No, definitely not. The Yelp Review Filter is just one of many mechanisms intended to assure the integrity of reviews on Yelp. In this post, our buddy Mat Siltala calls out a local merchant who just doesn’t learn. And, it does a decent job of filtering Yelp Review Spam. The problem is that the Yelp Review Filter is built on rules (or algorithms) which may occasionally register a false positive. Let’s face it, the typical internet user is more likely to post a negative than a positive review consistent with the old adage “a happy customer might tell a friend, an unhappy customer will tell everyone”. What’s wrong with these? Who can say. Two of them are what Mat calls “Orange Heads”, but the third is a somewhat active Yelper. He’s got a profile pic, he’s got friends and a number of reviews under his belt. The ServiceMagic blog has a great interview with Dr. Justin Bazan who is a top business on Yelp and has even been pointed to in Yelp presentations as a model. Given Park Slope Eye has been cited in Yelp presentations as a shining example, this must be an approved technique. I wonder if that Lip Balm he’s giving away is a Yelp branded giveaway like the one on my desk. That’s not asking for a review, is it? This guy is such a Yelp fan that he’s even linked to Yelp in his claimed Google place page. So, what if you don’t have the time or ethics to do it the right way? It’s always possible to spam the Yelp review filter and Dr. Bazan and Mat give us some good ideas. Don’t be an “Orange Head” – get a profile picture. Since you’re spamming, you might as well find a demographically appropriate photo on Flickr or another image sharing site and call it your own. Make some friends – scout around the area where you’d like to post your spammy reviews. Who else is reviewing the types of establishments for which you’re spamming? Compliment them, mark their reviews as Useful, Funny, etc. and then add them as a friend. Write a bunch of reviews – pick a few of the top reviewed spots in your area and rewrite elements of their existing reviews. Since you’re never actually going to those places you should mix up your star ratings to make it look good. As my friend Matt McGee says, we don’t live in a 5 star world. Some of your new Yelp friends will no doubt find your reviews Useful, Funny or Cool – because that’s what it’s all about. Then, once you have a good profile and your reviews are no longer being filtered go ahead and post that 5 star review for your employer and that 1 star review for the competition. Don’t forget to make it natural. You’ll want to load your reviews over time to look like a real human being. That’s how you spam the Yelp Review Filter. With the review filter, Yelp’s intentions are good. Like many of their efforts the rhetoric and execution are not a perfect fit. It’s easy to see how one might view it as evil. If you’re a legitimate business, you should now have some tools at your disposal to help you manage the Yelp Review Filter and hopefully some insights into Yelp in general. One thing to keep in mind is that Yelp doesn’t want you to ask for reviews. I know, that’s inconsistent with good business but it’s their ball and they can take it home anytime they want. If you’re a spammer, trying to spam the Yelp Review Filter, I’m sure you already know all that. Since this seemed like an evergreen topic I posted it as an article rather than a blog post but because I’d love to hear your feedback I put up a blog post. Please head over there if you’ve got something to say!